The weekend section of Asahi Shinbun has a fun regular feature where they present some recent surprising statistic (ok, I think it's fun; your mileage may vary). It's short and simple enough that I can read it without too much trouble. Today they displayed the total one-way commuting time for students (including university students) and workers, respectively, in the Tokyo and Osaka areas, and how it changes over time (sorry, not online; I eyeballed the numbers for the Osaka area in the graph below). The current one-way average time for students and workers is about 72 and 67 minutes around Tokyo and 76 and 63 minutes around Osaka. One-way commuting time around the Osaka area. Very approximate. The piece highlights the fact that students in fact spend more time than workers on the commute though the common perception is very much the opposite. I find two other things more interesting, though: first that my own commute, at an hour and ten minutes, is just about exactly average. And since I travel against the flow so to speak - out of the city in the morning, in again at night - I get to sit quite comfortably for most of my trip; I have nothing at all to complain about in other words. The other interesting thing is the dip in the graph. The 1995 peak coincides with the economical bubble in Japan and the subsequent dip with the recession. What, I wonder, is the actual reason for that? It's not employment directly. The survey is the time taken for commuters, so people not commuting - like the unemployed - aren't counted. Besides, the school commute shows the same peak and dip, and I don't think school attendance swings up and down along with employment. 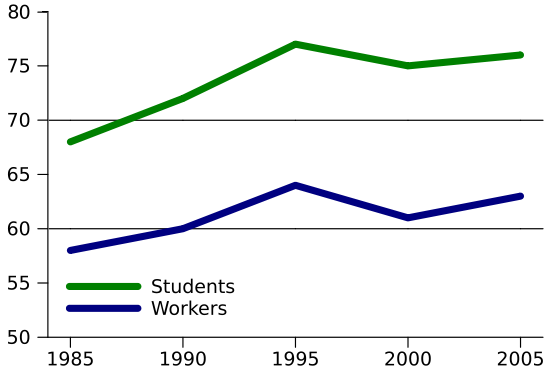 If anything, university and trade school enrolment would tend to move in the opposite direction as people without work choose to study instead. So the distance commuted is changing, perhaps. People move closer to their workplace when economy is bad, and further away when it is good. Not impossible: move to leafy suburbs with big houses in good times, or scrimp and save in cheap company-owned dormitories in bad. The overall trend would be explained as well, with more people moving to suburbs over time. But while the underlying trend may be explained in part by this it doesn't feel like you'd see such a large effect from the bubble, recession and recovery on this short a time scale. And it's not changing to jobs closer or further away either; if anything I'd expect the average workplace to be further away in a recession, as you can't be as picky about what job you take. So perhaps distance doesn't change but the time taken does. The government will tend to splurge on public infrastructure in down years in order to stimulate the economy - you'd get more bus lines, denser train departures and new roads, bridges and tunnels; the Japanese government is of course notorious for spending money in this manner. But then, those bridges or buses don't generally disappear again in boom years (the great thing about infrastructure is that it tends to stick around), so you wouldn't see such a neat uptick in commuting time in good years. The final possibility - and my guess - is other commuters. With a better economy you have more people commuting. Which means more traffic congestion, full trains and delayed buses. And I suspect especially that in a boom economy more people use their car rather than public transport, something which especially in dense urban areas can actually take you longer than the subway (and longer still, of course, when stuck in a traffic jam due to all the other car-borne commuters). So, if the trip to work or school seems to take longer than ever, be happy - things are going well overall in other words. If your commute is getting faster and smoother on the other hand, it's time to worry about job security. And if you're the only living person in sight one morning, it's time to wonder if you perhaps should have paid a bit more attention to that news flash on some radioactive giant reptile attacking the city. Remember, learning important Japanese like "怪獣" (kaijuu) may save your life one day. Or at least let you sleep late one morning.